Did you know that scuba diving is the closest thing to flying? The immense freedom you experience as you scuba dive is out of this world. Once you get into the water, you become a part of the marine world and you experience the peace and calm that only exists in the water (No traffic noise, phone calls nor talking just the sound of marine life). If that is not soothing, what is? 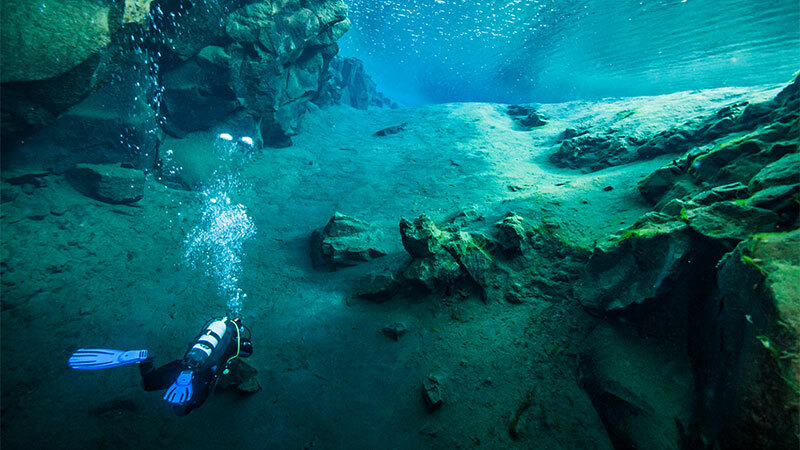 One of the best places to scuba dive is Iceland. Below are ten of the best sites to scuba dive in Iceland. Located between America and Eurasia continents, Silfra Rift is a freshwater rift considered to have the clearest water in the entire world. The rift is made of sand; lave rock and algae making it beautiful. 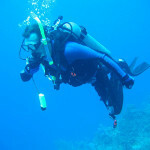 Not only is this scuba dive beautiful, but it is also easy to access and interesting. The dive has a visibility of more than 300 feet and divers and snorkelers get to experience the feeling of being between two continents at the same time. Furthermore, there are certain places in the rift where the snorkelers and divers get to touch the two continents at the same time. Located about 72 miles from the capital of Iceland, Gullfoss is an amazing waterfall that is considered to be one of the most beautiful nature sites in Iceland and the most beautiful waterfall in the entire world. Its name translates to “Golden Waterfall” in Icelandic and the name fits it perfectly because on a sunny day, Gullfoss creates a mist that covers the whole area in shinning golden veil once the mist comes into contact with the sun. Geysir consists of many boiling hot pots and two active geysirs. Between the two geysirs, Strokkur is the more active one with eruptions every 4 to 6 minutes. A visit to this amazing location not only gives you the chance to dive in the beautiful waterfall, you also get to experience nature at its finest. Translating to “garden” in Icelandic, Garður contains more than 42 species of marine algae. Diving into this beautiful dive gives the experience of a lifetime as you explore marine garden. Garður also consists of kelp forests, which form habitats for numerous fish species including wolf fish, monkfish, scorpion fish and much more. Besides the beautiful marine garden and forest, Garður also features beautiful stretches of sandy patches. Garður is located at the south of Reykjavik. Recognized as the only place in the entire world where man can reach geothermal chimneys, Strýtan is located in Northern Iceland in the middle of the Eyjafjörður. While here, divers get to feel the hot water welling out of Strýtan as they experience the amazing flora and fauna that have managed to thrive in such special circumstances. However, it is worth noting that this place is ideal for physically fit advanced divers who are able to control their buoyancy to avoid coming into contact with anything. Diving into the Kleifarvatn Lake gives you the chance to experience the bubbling hot water springs found deep in the lake. The lake might be remote looking but do not let that fool you because it has amazing landscape surrounding it. With a depth of about 295 feet, the stunning Lake Kleifarvatn is among the deepest lakes in Iceland and is located about 18 miles from Reykjavi­k. If you are having a hard time deciding whether to dive into freshwater or the ocean, Bjarnagjá lava ravine is where you need to go. Located near Grindavik town, the freshwater in Bjarnagjá is mixed with ocean water that enters it from the end of the fissure giving this 59 feet lava ravine an amazing mix of both fresh and salty water. This amazing site is also close to the beautiful and famous Blue Lagoon, which you can visit once you get to Bjarnagjá site. Considered the Silfra of the north, Nesgjá is a stunning freshwater fissue with clear water that can only be found in Iceland. This beautiful dive site gives you the chance to experience water in its purest form. Its lagoon is also huge and if you have the best quality dive mask, you get to enjoy the highest level of visibility that can go beyond 300 feet. If you are lucky, you can see a type of salmonide known as arctic charr, in the fissue. Known for numerous steep fjord cliffs and stunning beaches, the Westfjords is an area that leads to the clearest ocean water in Iceland. The number of dive sites in this area is countless giving you the chance to pick your favorite dive spot. Besides the many dive sites, the area also consists of several wrecks and old artifacts. In addition, you get to explore the rich marine life such as monkfish, dolphins and whales. If you love history and exploring wrecks, then you will definitely fall in love with this dive site. The El Gillo is a British oil tanker wreck that is approximately 492 feet long with a weight exceeding 7000 tons. Located in the Seyðisfjörður in the fjord, the British tanker was sunk by the German fighter planes in 1944. 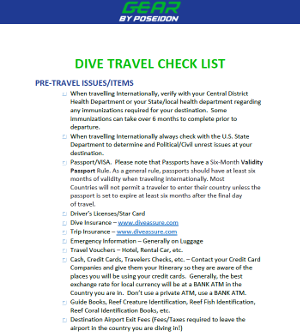 However, for you to dive here, you need to be an advanced open water diver certified by Professional Association of Diving Instructors (PADI) or another recognized organization. Located in Reykjavik, Gullkistuvik is considered the gold treasure of box bay and that is exactly what it means in Icelandic. Surrounded by large rocks and a beautiful beach, the Gullkistuvik bay may be shallow but you can reach depths of up to 49 to 55 feet. Once you reach under surface, you experience the beautiful kelp forest and the marine life found in between the boulders and rocks. H owever, be sure to stay inside the bay once the currents on the outside become strong but if you trust yourself, you can dive against it. So there you have it, ten of the best scuba dive sites in Iceland. If you have not visited any of the above sites yet, you definitely need to make it a priority. The thrill and experience you are going to get is totally out of this world.